Middling at best.With the likes of two potentially elite pitchers Dallas Keuchel and Craig Kimbrel standing pat for a desirable bidder, this has caught the chagrin of Twins rage twitter, and you can’t blame them. Imagine inserting Kimbrel or Keuchel into the pitching staff, and the added perks would benefit all parties involved including the most important; rectifying the vast abyss of Twins rants on the interwebs. It isn’t any secret that the Twins have loads of room to supplement the roster to make a bid for the division. With the Indians unloading after 3 years of reigning as division champions, and the Royals, Tigers, and White Sox currently having no plans other the than tanking, the crease is there for the Twins to make a run for the Indian’s money and to snap a near decade for a division title deprived fanbase. Even to that tangent, what even is more baffling is that the Twins have an unprecedented allotment of salary (I felt so deeply compelled to say cap room) on the checkbook or whatever ledger the stingy twins utilize to organize their expenses. As Minnesotan Fans, we are so inherently adept to mediocrity and heartbreak, it’s as if misery is in our compatible middle name. But in this instance, there’s only room to spectate and to be optimistic, which is undoubtedly a tough pill to swallow. The ugly is so glaringly obvious. The kid pitched to the horrendous tune of a 6.22 ERA last season and owns a below average 4.63 ERA. He’s got a poor career 4.44 FIP, and doesn’t strike people out. Watching some footage of his former* (as in last season he was converted into a reliever because he was so awful) starts, the guy doesn’t have an appealing secondary pitch, his control is rather iffy, and his changeup has fallen off a cliff since its former dominance prior to his injury. Speaking of injury, the guy spent 3 stints on the disabled in only the past year, has operated on for Tommy John, and is as far as away from durable as Minnesota is from Texas. The thing Perez isn’t terrible because he’s bad. As contradictory as it sounds, he isn’t necessarily by any means as pitiful as he appears. Looking at the tape, its as if his performance rides a rollercoaster. During the first inning, the guy is as rocky ever. He gets in many hitters count, can’t find the zone, and gets rocked once he does in 3-0, 2-0, 3-1, or 3-2 counts. But strangely he settles down and is frankly razor sharp with precision in the middle innings. That sinker-changeup combo is to die for on the edge of the plate, and reminds me a lot of….JA Happ. I think toggling with his sinker/four-seamer to changeup ratio, and maybe a change of scenery would do him wonders. 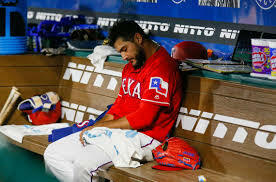 Not to mention, GLP in Arlington is no easy place to pitch, because the ball CARRIES out there. The Good, and How to enhance it??? Believe or not, Perez once was pegged inside the Top 100 prospects in the Baseball America’s 2010 edition. Don’t think because of this though, that I expect him to fulfill his top billing as a prospect. The guy has upside which at this point is hard to believe. But as I watched the tape, he isn’t the doormat pitcher as his number would indicate. He’s a solid and competent enough pitcher in the middle innings and is maybe or not a little shaky-nervous at game tilt. Beyond that, he’s got excellent above-average velocity from a left-handed starter. His relative youth and exuberance leaves room for hope of improvement, and he’s 28. He also is a ground ball demon and induces a well above average GB rate, and at worst is a decent innings eater. We’ve seen this regime sign the flyer free agent, as referencing last year’s Anibal Sanchez reclamation project. After looking at Sanchez’s pitch usage, there’s nothing at first glance that collasally has changed. But taking a deeper dive, we can see that Anibal has surged up in his career ranks in Chase%, Pitches out of the Zone%, and overall Strikeouts%. But his pitch movements, usages, and varying peripherals haven’t drastically changed. What can be attributed to this surge is pitch sequencing. Sanchez better utilized his changeup in complement because he threw the pitch out of the zone. He Split-Finger had a career-high strikeout rate in volume, and had the most minuscule SLG percentage in terms of volume pitched. He cutback the vertical movement of his 12-6 curve, and upped the ante of his split-finger that fit perfectly to a series of pitches (sinker, cutter, split) that better suited his repertoire, featuring horizontal movement. Which is a primary reason why Anibal had a renaissance season. Perez bears a striking resemblance to Sanchez, in their deficiencies. All of this surmounts to absolute and utter baloney if Perez resists in reinventing himself as a pitcher. This, however, does include an unorthodox approach, and completing throwing the entire baseball manual out the window, and tinkering with breaking balls. Look at the Rich Hill’s and the Drew Pomeranz of the world, and we’ve even seen Tyler Duffey rely on an off-speed pitch more than his fastball firsthand. Albeit none of this pitchers are All-Star commodities, they all in some capacity became better to some extent by heavily depending on their secondary stuff. There’s no denying Martin Perez is a fully capable and average enough MLB arm, but the real question remains; Will Martin Perez be open to tinker his arsenal, and if not were the Twins better suited to have unleashed a prospect in his place? That remains to be seen. I don't know if I would place as much stock in your 1st inning theory.He was poor in the 1st inning for 2017-2018 but over his career it hasn't been a problem.I only saw the trend you outlined truly happen in 2017, where he was poor in inning 1 but good for innings 2 thru 4.From 2013-2016 his 1st inning ERA's were 4.50, 2.25, 1.93, and 3.82. His times through the order stats support what I would consider the usual trend in that he gets worse each time he sees the lineup. Great first blog post, Sabir! And I think you're right.The Twins didn't sign Martin Perez in a vacuum.Someone--Josh Kalk?Wes Johnson? --saw something on video with him and has an idea on some changes they would like to try. Time will tell if they are right. I agree. Just like they spotted something with Anibal Sanchez. The availability of starting pitching this off season was minimal. At worst he's a cheap placeholder for Mejia, Stuart, Thorpe, or even Rosario. When one of those 4 decide to shine, most likely Perez will be DFA'ed.